Ian Gibson’s work with Alan Moore on The Ballad of Halo Jones is lauded as some of the legendary weekly comic book’s greatest. And to celebrate the latest edition of Halo Jones, complete with a new introduction by Zoo City author Lauren Beukes, Gibson will be signing at Gosh Comics on Berwick Street in London from 2pm to 4pm on Saturday 27th April. 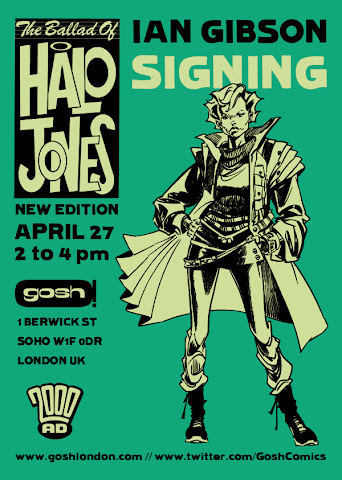 The new UK edition of The Ballad of Halo Jones, due for release in May 2013, will have a brand new design-led cover by 2000AD head designer Simon Parr. Dubbed “possibly the first feminist heroine in comics” by The Observer, the ground-breaking series introduced readers to a poignant, fascinating, and at times heartbreaking story of an ordinary woman who lives an extraordinary life. Set in a future where the unemployed are herded into the Hoop, a floating ghetto off the coast of Manhattan, Halo is a young woman who dreams of escaping her boring life. When she gets the chance to do so aboard a luxury space cruiser as a hostess, it catapults her into an uncaring galaxy that will take her from the lap of luxury to a time-bending war of atrocity. Here's the lowdown on the latest Commandos, on sale now in all good newsagents and on an increasing number of digital hoojimaflips! 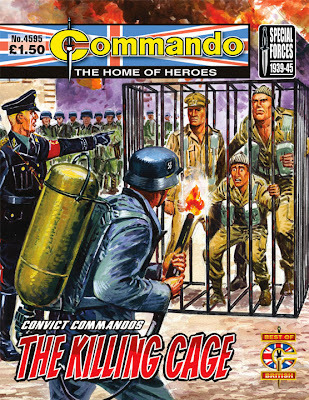 Good to see the Convict Commandos back, and that one of this round's reprint titles features art by Denis McLoughlin - always a treat. It was a straightforward assassination mission for the men of the Convict Commandos; the sort of job they had been sprung from jail to do without breaking a sweat. But this time they were up against an adversary who had a lot of experience of attempts on his life. He would make things very hot indeed for Major Guy Tenby's men… using a flamethrower! Sergeant Jack McBride of the French Foreign Legion was on the track of the bandit who had stolen his unit's payroll. When he caught up with the theif, Amadou Bin Farzi, he intended to make him suffer for the crime by throwing him into a French jail. He had no way of knowing that when he did capture the rogue he would set of a train of events that would end in Bin Farzi being the only man who could keep him alive. The question on Jack's mind then was, would he? 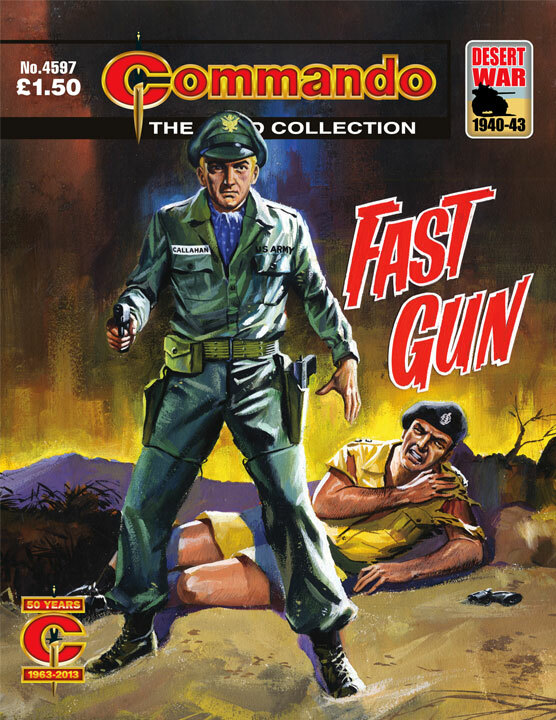 Originally Commando No 85 (September 1963), re-issued as No 571 (August 1971). Lieutenant "Duke" Callahan, Yankee, was new to the desert war. He was tough - but green. Lieutenant Bruce Wilson, Britisher, had been fighting sun, sand and Germans for a long time. He had plenty of toughness too - but he knew how to use it. These two would have made a great team together. That was the idea. But they took to hating each other's guts - and when that happened that big desert just wasn't big enough. 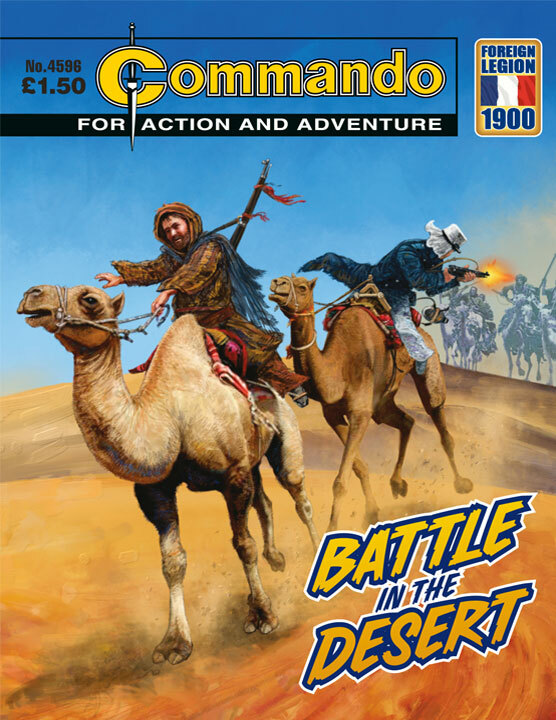 "In every Commando story it's a given that there's a war going on," notes editor Calum Laird of this re-presented story. "The other given is that's very unlikely to be the main conflict in the tale. Somewhere the characters will be at loggerheads; if they're on the same side and come to blows so much the better. "Lurking behind Ken Barr's cover art is just such a story, well realised from a Clegg script in strong black-and-white by early regular Commando artist Bielsa. Some of his tank edges look sharp enough to cut you as you read. And reading is what you're supposed to do. "So if you fancy a sparring contest in the desert, this is one for you." They had captured a German Colonel! Quite a good day's work, was that. But in doing it they had also saved him from being murdered by a bunch of brigands, and although they didn't know it at the time it was going to save their own skins pretty soon. "An intriguing tale, this," feels deputy editor Scott Montgomery. "One where we have some fairly standard Commando heroes and villains but, as the story unfolds and we get to know them, we discover that not every character behaves in the way that we may have expected them to. "That's a sign of some good writing… and sub-editing. If done properly, editing should be the "invisible" part of a comic strip - something that the reader really should never have to think about. Years ago, as a youngster reading comics, I used to think that they arrived fully formed on newsagent shelves as if by magic every week - hopefully some of you still feel the same way. " 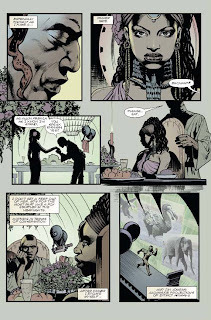 Jim Campbell have a short story, "Eden", in the latest issue of Dark Horse Presents (#23), on sale now in all good comic shops. Jim Alexander's publishing debut came as writer of Calhab Justice for Judge Dredd Megazine. He then went on to script Judge Dredd, Pandora and O'Rork. Recent work includes Gabriel, Scout One and for Black Hearted Press, and he recently formed a new publishing company, Planet Jimbot, with Jim Campbell (read our interview with Jim A about this venture here). An SF tale centred on a man seeking to save Africa from environmental disaster, "Eden" a bit of a landmark for Jim Campbell, as it marks his first ever lettering for Dark Horse. "I've been admirer of Dark Horse as a publisher since their earliest days, so this is a big deal for me. (Plus, y'know, John Watchmen Higgins.)" Jim's lettering has graced the pages of both indie and mainstream comic titles, including the new STRIP: The Adventure Comics Magazine, where he's an invaluable part of the mix. DHP #23 also features Dan Jolley and Leonard Kirk's supervillain tracker Clev, back out of prison to help the FBI hunt an invisible killer, Fred Van Lente and Freddie Williams II delve into a world of psychic espionage in Brain Boy, and Peter Hogan and Phil Winslade pull you into another magical dimension with "King's Road" (see news story). (via Lew Stringer): British comics have often featured activity pages amongst the strips, from the humble reader's jokes page, 'How to' features on magic tricks, and puzzle pages such as Teaser Time. The latest thing appears to be the pranks page, with readers actively encouraged to play harmless pranks on their parents and pals, with step-by-step instructions on each mischievous moment. Artist and writer Lew Stringer reports that this week's issues of The Beano and BeanoMax are no exception. In The Beano he's illustrated Pop Goes the Weasel, - "and no, weasels are not involved," he says. "It's a prank involving keys and balloons." 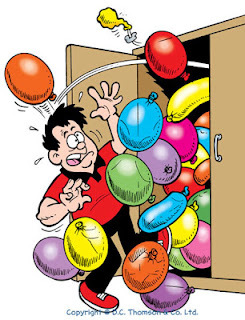 It's a busy week for Lew watchers: over in BeanoMax, his cartoons run across five pages for the It's Prank O'Clock feature, telling kids how they can get up to 15 pranks during the course of a day. "This week's Beano is rather special because not only does it feature the return of the cover strip (as opposed to one big picture) it also contains the debut of four new strips," Lew enthuses. His Rasher strip continues apace! Here's Neil Gaiman's keynote speech at this year's London Book Fair, in which he talks about the need to experiment with new media and pretty much sums up what we're all thinking -no-one knows what is really going to work in the new digital medium - so experiment. Gaiman believes that "Amazon, Google and all of those things probably aren't the enemy. The enemy right now is simply refusing to understand that the world is changing". With a nod to forward thinker Cory Doctorow ("Think like a dandelion") he said later of the speech: "When the rules are gone you can make up your own rules. You can fail, you can fail more interestingly, you can try things, and you can succeed in ways nobody would have thought of, because you're pushing through a door marked no entrance, you're walking in through it. 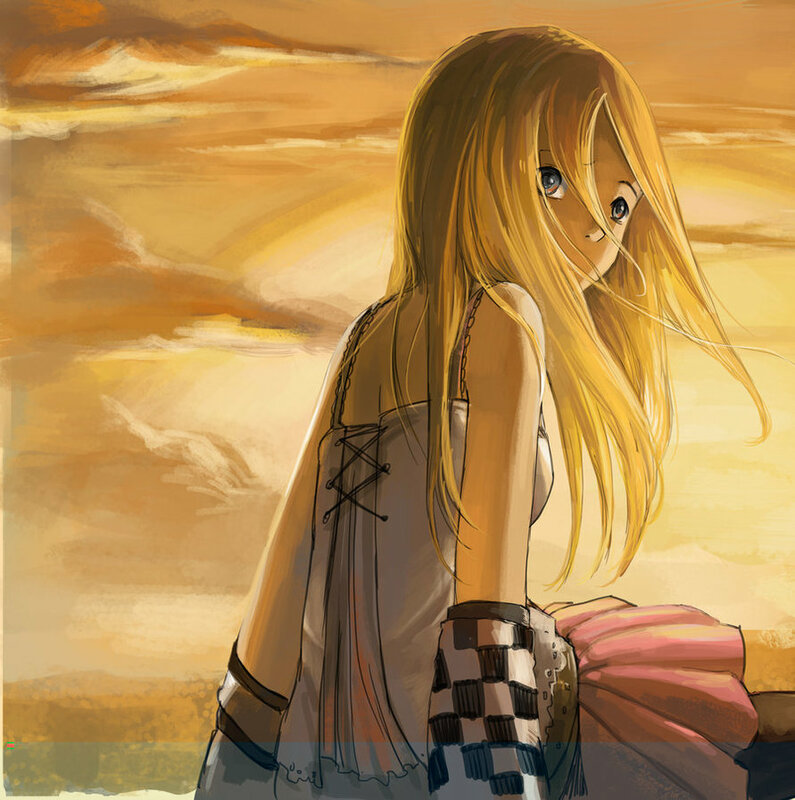 You can do all of that stuff but you just have to become a dandelion, be wiling for things to fail, throw things out there, try things, and see what sticks." British comic creator and Heavy Metal editor Dave Elliott -- who's a busy chap right now, as he's also currently working closely with Titan Comics on their upcoming launches -- is part of the creative team on Dravn, a new series launching in Heavy Metal Issue 262, on sale now. Fans are in for another themed-issue treat as Dravn is unleashed for a full-issue saga of inter-related tales where dizzying heights of storytelling mastery cross paths with unadulterated science-fantasy. 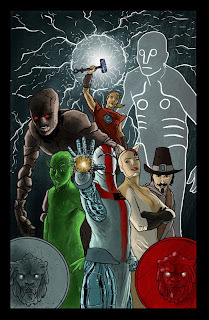 What if super-powered heroes and villains have always existed, buried somewhere under our mythology and folklore? We're not talking about capes and tights, we're talking about the real demi-gods that walked and pounded the Earth! Created by filmmaker Jesse Negron (American Fighter Pilot, Pop & Me) and written by Negron with Dave Elliott (ATOMEKA, Monster Massacre), Dravn features characters designed exclusively by Hollywood concept artist Keith Thompson (Don't Be Afraid Of The Dark, Pacific Rim), and brought to life by artists from around the globe, including members of Imaginary Friends Studios and STELLAR Labs, to name a few. In this epic story, history and legend get a bit twisted with characters as diverse as Camelot knights and Romanian impalers and Nazi stormtroopers all getting connected by greater forces, as super-beings stand revealed as the decision-makers and the rest of humanity left struggling with the pieces of a cosmic gambit more screwy than a primetime news headline. Said Heavy Metal editor Dave Elliott, "I have always felt fiction is escape. Anything that takes you from where you are to someplace else is by definition escape. I think the metaphor is the most effective way of achieving that escape. By creating something that feels familiar and resonates with you it's easier to believe in and therefore a more immersive experience can be achieved. "With Dravn we're taking you to places that you've heard of and are familiar with and subverting them. 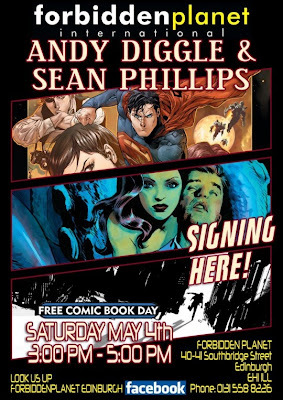 Not much different from doing an "Elseworlds" or a "What If" story but with history and myth." 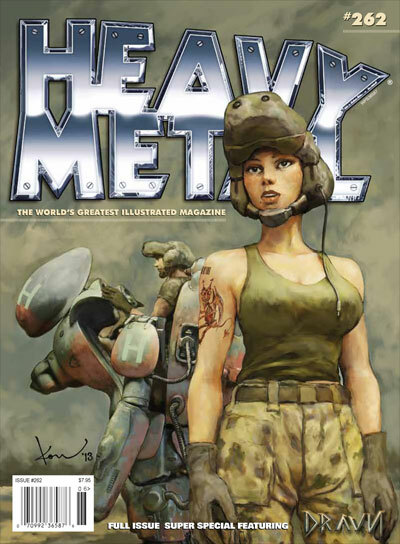 Featuring an iconic choice of hyper-gorgeous covers by Kow Yokoyama, Kendrick Lim, Rob Prior, and Stanley Lau, the king-sized issue is on sale now at finer books and comics shops everywhere, as well as directly from Heavy Metal. Dravn is set to dive across mediums, across platforms, and it all starts in the pages of Heavy Metal. Eco Comics has been celebrating St. George’s Day by announcing its next comic book series, Englishman, written by Chris Bunting and illustrated by Valentin Ramon. It will be a paperless-exclusive title from the award-winning 'green' publisher. "I often feel quite envious of the patriotism that so many other countries display, but 'England' has almost become a forgotten, even a dirty, word," Bunting says. "To paraphrase the historian David Starkey, we should celebrate, and not be ashamed of, England. "To help address this, just as the US has its Captain America, I realised that England needed its own patriotic super hero: enter Englishman. "This is the most ambitious, dark and controversial title that I’ve yet written," he continues. "But expect fun, fireworks, and my usual irreverence. "Also, expect plenty of famous English faces to appear in comic book form for the first time - the cover preview reveals some of them. Plus, there are brand new, quintessentially English characters, including Greenbelt and Dry Stone Wall." Further details on the Englishman project are due to be announced. 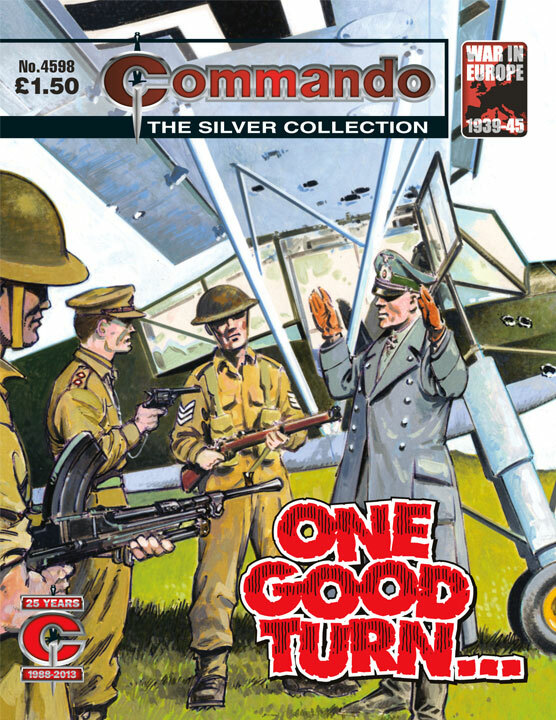 The publisher states that the first issue will be in a new format previously unseen in comic books and free to download. 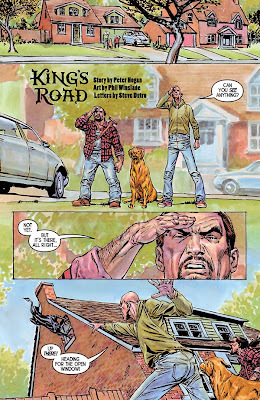 Peter Hogan (co-creator of Resident Alien) returns to the pages of anthology-title Dark Horse Presents this month with a new story entitled "King’s Road", drawn by Phil Winslade. 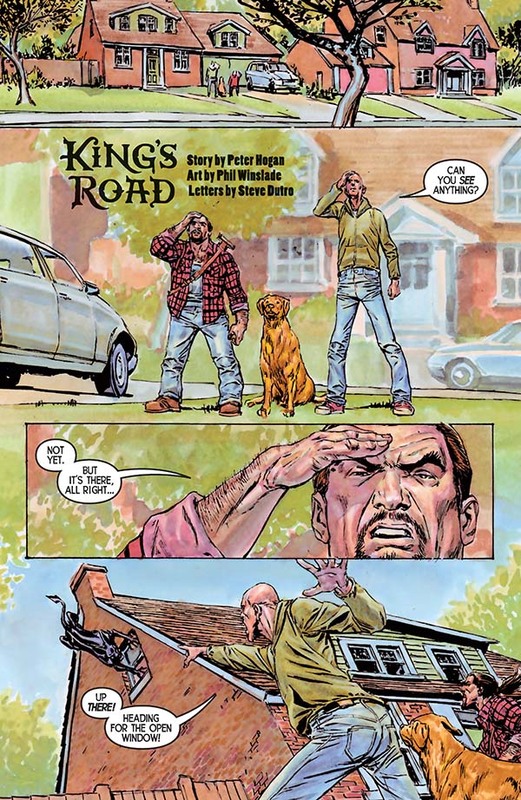 Dark Horse tell us King’s Road is sure to be another gem for the Eisner-winning monthly, a story that centres on some average suburban kids whose lives are turned upside down when a nightmare from their father’s hidden past came to hunt them down. Now they must fight the evil forces of the usurping witch Malicia for the right to rule a magical kingdom. “King’s Road is about someone from another world – a magical, semi-medieval world," Peter says, "who came to Earth about twenty years ago, and settled down and raised a family here. But now he has to go back again, taking his family with him, because he’s inherited the throne of that world. "Meanwhile, there are all sorts of nasty magical creatures trying to kill him before he gets there." 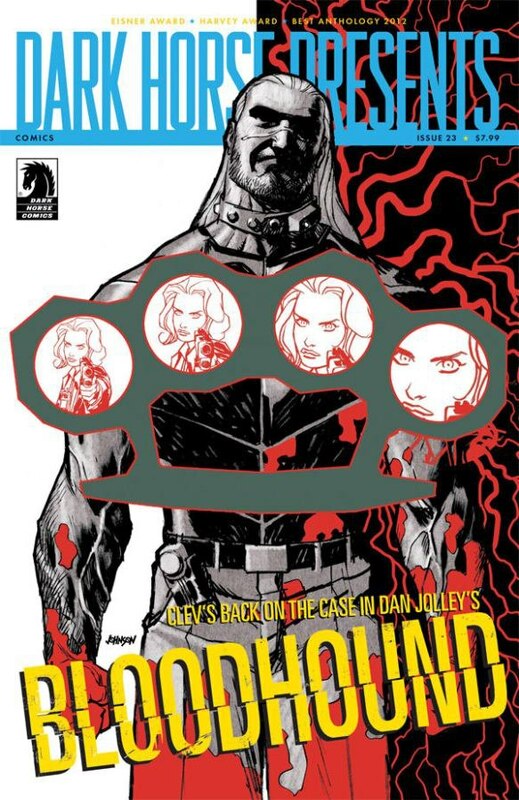 Phil Winslade has been drawing comics since 1990, with his work published by Marvel, DC, Dark Horse, 2000AD and Fleetway on books such as Daredevil, Legends of the Dark Knight, Shadowpact, Nevada, Monolith and Howard the Duck. • Catch King’s Road in Dark Horse Presents #23, on sale now in comic shops this week. 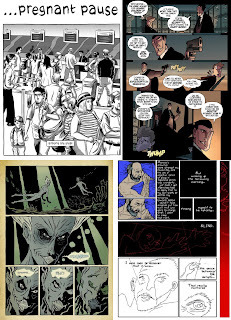 A call for papers for Transitions 4 - New Directions in Comics Studies has just been published. Transitions will be a one-day symposium at the University of London in November, promoting new research and multi-disciplinary academic study of comics, comix, manga, bande dessinée and other forms of sequential art. Now in its fourth year, the Keynote will be given by Dr. Ann Miller (University of Leicester, joint editor of European Comic Art), with response from Dr. Roger Sabin (Central St. Martins, University of the Arts London). By thinking about comics across different disciplines, we hope to stimulate and provoke debate and to address a wide spectrum of questions, to map new trends and provide a space for dialogue and further collaboration to emerge. The organisers welcome abstracts for twenty minute papers of 250 - 300 words. • Proposals for papers should be sent as Word documents, with a short biography appended. Abstracts should be submitted by the 30th July 2013 to Hallvard, Tony and Nina at transitions.symposium@gmail.com. • Last week's episode featuring interview with Louis Roskosch about The Adventures of Leeroy and Popo, and Matt Fitch and Mark Lewis about Frogman is available online now. Hasbro has launched a worldwide promotion inviting fans of all ages around the globe to help create a new Transformers character that will be forever added to the Transformers world - including new comics. In anticipation of the Transformers’ brand 30th anniversary in 2014, the “Fan Built Bot” Poll kicked off this week, and will run through 5th May on Transformers.com/vote. Hasbro is inviting fans - and, given the success of the comic down the years in the UK, we know there are plenty of British ones - to vote daily to shape this new Transformers character. The new character will be made into an action figure featured in the “Thrilling 30” line of toys to celebrate the anniversary. Hasbro is giving kids and fans the opportunity to make the “Fan Built Bot” character with votes determining everything from being an Autobot or Decepticon - to its vehicle or other mode, colour, personality and more. Kids and fans are encouraged to vote daily. Also, to keep with the theme of the fans being the ones who really shape and create this new Transformers character, Hasbro will also give fans a say in the naming of the new character. More details on the naming will be announced soon. “Since 1984, the Transformers brand has been bringing entertainment and excitement to kids and fans with our beloved characters like Bumblebee and Optimus Prime,” said Jay Duke, vice president of the Transformers brand at Hasbro. “We invite all fans to help us kick off the 30th anniversary of Transformers with a new character of their choice — for the first time in history? The results of the poll will be announced by Hasbro at this year’s Comic-Con International in San Diego, as part of the official kick-off to Hasbro’s Transformers “Thrilling 30” anniversary celebration. Kids and fans will be able to purchase the “Fan Built Bot” character as a toy and will see the new character appear in official Transformers comic books.